For me, most Mexican food is incomplete without a little pico de gallo. The slightly sweet, spicy, and acidic salsa is the perfect condiment to go with my tacos, tortilla chips, burrito bowls, tamales, slads, chicken... the list goes on. While I normally keep a container of store-bought pico de gallo in the fridge (the Walmart grocery brand is actually my favorite, believe it or not), I recently found myself with tacos to eat and no pico de gallo to go with them. Thankfully, my over-buying at the grocery store came in handy for once and I happened to have everything I needed to make my own! HOW I MADE IT Pico de gallo is pretty simple. It consists of tomatoes, onions, jalapenos, garlic, cilantro, and lime juice. Don't forget the lime juice. It ties everything together! I started by seeding and chopping the tomatoes. Then chopping up half an onion so that the pieces of tomato and onion were similar sizes. To get rid of the harshness of the onion, I soaked the onion piece in water while I prepped everything else. I wanted the garlic flavor to be evenly dispersed throughout the pico, so I "pureed" it with my knife. To do that, I first minced the garlic, then sprinkled coarse salt on top and scraped the blade of my knife over the salted garlic. I hold the blade at almost a 90 degree angle and go back and forth several times until it's a paste-like consistency. Then I finely chop up some cilantro and some jalapeno. Everything goes into a bowl with the juice of 1 lime, some salt and pepper. Then it goes to the fridge to "marinate". Pico de gallo is sooo much better once it's had a chance to sit in it's juice and get all happy It only takes a few minutes in the fridge (30 at the least), then the pico is ready to eat! 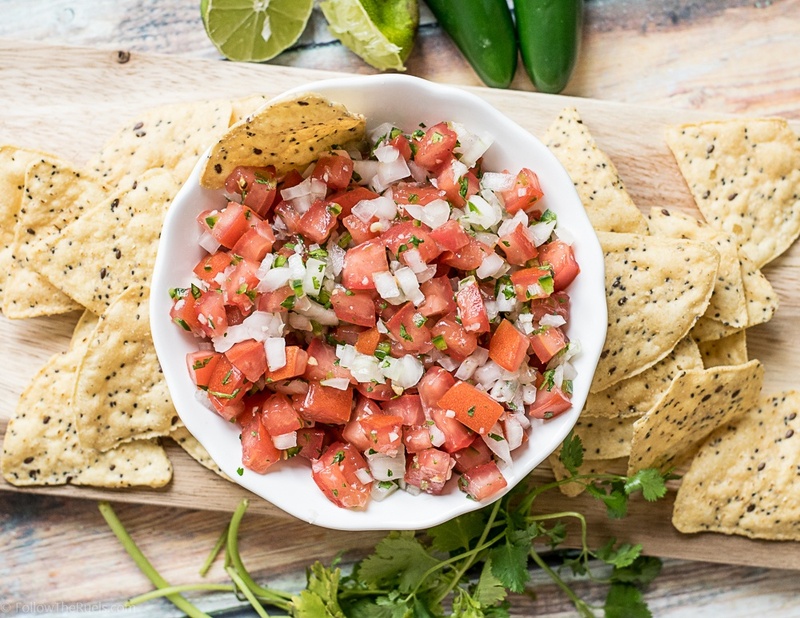 Homemade pico de gallo is so much easier than you think, and its a heck of a lot better than the stuff at the store (even the stuff at Walmart). I forgot how much I like making my own because I can control the heat, and more importantly, the garlic! I like my pico to have a distinct garlic flavor (you'd be surprised at how many store bought picos leave out the garlic completely!). But if that's not your speed, then you can pare it back! Next time you find yourself without some salsa on hand, make your own instead of running to the store. Plus, it's a good opportunity to work on some knife skills! Add all ingredients to a bowl. Toss to coat tomatoes in lime juice. Let rest in the fridge for no less than 30 minutes.